The 1940s must have been an hilarious time. Except for the war of course. And the rationing. But if people really spoke like the chaps and chapesses on The Fitzrovia Radio Hour everyone must have been falling about in laughter every time a neighbour opened their mouth. 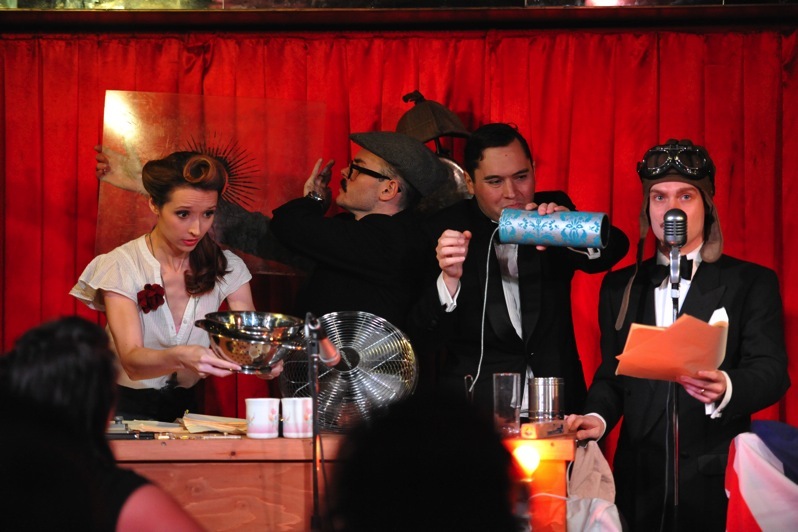 A spoof of a 1940s radio show The Fitzrovia Radio Hour is performed live on stage with excessively RP voices the order of the day. These are of the Harry Enfield Women know your limits variety and get laughs by the sheer absurdity of their pronunciation. Three microphones stand around the stage but the centrepiece is a table on which different sound effects are created. Several stories are told over the evening, including a disagreeable spoof of James Stewart’s classic It’s a Wonderful Life and the sound-effects driven Boxing Day Champ. The performances are top notch but the plots are generally weak and not in a how-delightfully-ridiculous way – although The Woman who didn’t Prepare is pleasantly silly. Best are the adverts for Soho Pipe Tobacco, the generous sponsors of the show; in particular the Charles Dickens advert is excellently presented and gets a well-deserved laugh. The multitude of silly characters and peculiarly created sounds gives all the cast a chance to shine as they move hurriedly between microphones and sound effects. Over the whole evening Fiona Sheehan is most entertaining – especially when she doubles as a housewife and a small boy in the same segment. But the most successful individual moments are Alex Gilbert’s collywobbly imitation of Charles de Gaulle and William Findley’s gurning display of belly dancing in Istanbul. You don’t need to have any idea what Charles de Gaulle sounded like or the nuances of belly dancing to find them amusing. The radio play conceit could be adhered to more closely. Why would the cast of a 1940s radio show change costumes when changing characters? When an actor switched to a different character there would not have been any need to change his hat to show he was playing someone else. So doing feels a sop to the audience and takes away from the purity of the radio play spoof idea. The black walls and black and white photos give the St James studio theatre a great speak easy atmosphere and drinks are not only allowed – there’s a bar at the back of the room. The seats are unnumbered so arrive early, ready to relive a time when chaps were chaps and every word had an extra syllable. Watch out for flying water melon. 12-23 December at the St James theatre.